The Council for British Archaeology has issued a statement in response to the Ofcom decision not to investigate “Battlefield Recovery”. “The CBA is very disappointed to learn that Ofcom is not following up on the very large number of legitimate complaints received in relation to the Battlefield Archaeology programme. We continue to believe that the TV programme showed a callous lack of respect for those who lost their lives in a major conflict and a lack of consideration for their loved ones. DOES BATTLEFIELD RECOVERY STATEMENT DIG A HOLE FOR OFCOM? 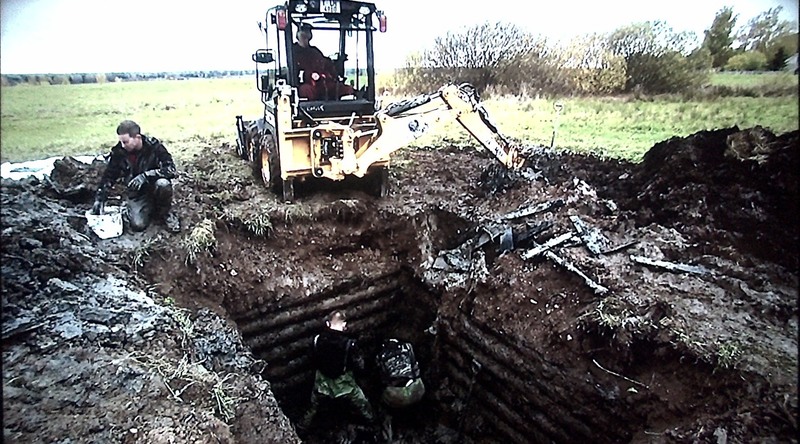 In a move which will dismay the archaeological world, UK Broadcasting regulator Ofcom has used the latest edition of its Broadcasting and On Demand Bulletin, to announce that it has decided not to investigate the controversial TV series “Battlefield Recovery”. The series, formerly entitled “Nazi War Diggers”, was shown in the UK on Channel 5 in January 2016 and received a total of 175 complaints, many of which alleged that the programme, which was made by London based ClearStory Productions, had shown the dangerous mishandling of ammunition and dangerous excavation practices as well as the insensitive and inappropriate handling of the remains of missing soldiers. “We assessed a number of complaints that this series was offensive and disrespectful in its treatment of war graves. We won’t be taking this forward for investigation. The controversy surrounding Battlefield Recovery was never one about freedom of speech. No one suggested such programmes should not be made. Indeed as is well known, many archaeologists many with media experience, tried to advise ClearStory Productions about how best approach the series. What the argument was about was the use of appropriate methods and above all safety. Against that background the publication of this statement from Ofcom is unlikely to reassure the archaeologists and expert bodies such as the Society of Antiquaries, the Council for British Archaeology and the Chartered Institute for Archaeologists, all of whom complained publicly about the series, that their concerns about the “contributors methods” were indeed effectively dealt with by the programme as Ofcom claim. It is believed more likely that many complainants will be concerned that the Ofcom Content Standards Team, which reached the decision, believe that the post production addition of subtitles and disclaimers, which many critics regarded as bland, unspecific and even contradictory when put against what was actually shown on screen, represent an “effective” dealing with the concerns of both professional archaeologists and independent expert Explosive Ordnance Disposal [EOD] officers. Supporting this idea, critics of the series are also sure to note that the vast majority of complaints came after the series was broadcast on Channel 5, complete with its subtitles and disclaimers, and that many complaints referred to specific instances of alleged bad and unsafe practices, citing as evidence what was actually shown to the TV audience. More particularly, it will also be noted that, while referring to unnamed “protocols” the statement omits to mention specifically that Ofcom believe ammunition was handled in a safe manner when independent Explosive Ordnance Disposal Experts argue that on a number of occasions it was not. Neither does the statement claim that the excavation practices shown were safe, when neither the subtitles, nor the on screen presenters, addressed the issue of excavation safety and the machine digging of deep trenches in wet and potentially unstable ground at all. Many will also question whether tipping a human skull out of a helmet represents sensitive handling, even if the presenters “appeared moved”. Taken together these questions suggest that, far from settling the controversy over Battlefield Recovery/Nazi War Diggers, the discussion will now move on to asking Ofcom precisely what level subject advice and expertise was available to its Content Standards Team when they were reaching the decision not to investigate a programme? Particularly as Battlefield Recovery/Nazi War Diggers was clearly known to be so potentially toxic that it had already been cancelled by its original commissioning body, the National Geographic Channel and by FoxTel in Australia. Archaeologists will also fear that the Ofcom decision, coming just a few months away from the centenary of the Battle of the Somme, might tempt other production companies might seek to emulate ClearStory’s mix of guns, bombs and bodies. They might also pause to question why the expert opinions of the leading industry and sector bodies and subject experts, seem to count for so little.